I used Sel de Guérande in these cookies, but if you don’t have fleur de sel, don’t worry. I maybe wouldn’t recommend regular table salt (which is too harshly salty– if that makes sense–for my tastes, even for everyday cooking), but a “softer” salt, like Kosher or sea salt, will work just fine. The recipe has a bit of chopped dark chocolate folded in at the end…you can be experimental with this bit, if you want. I used a combo of chopped bittersweet chocolate and cocoa nibs, so that there would be a little gooey melted chocolate and a little bitter crunch in each bite. Can world peace really be achieved through a cookie? Oh, if only it were that simple…but if the new Administration wants to give it a go, I’ll happy accept the position of Secretary of Snacks! To feel like you’ve gone to Paris without leaving home, read cookbookhabit or see Baking: From My Home to Yours by Dorie Greenspan for the recipe (she also has it here on The Splendid Table’s website). Don’t forget to check out the TWD Blogroll. Your cookie looks perfect! I had a bit of trouble cutting mine from the log, so I couldn’t get that perfect look that your has. I’m so jealous that you have been to Pierre Herme! I’ve never even left Australia! Absolutely beautiful photo. makes you want one of those cookies right now. et oui si c’était si simple… 🙂 très belle photo ! They look great. Cookies is Paris sounds pretty dreamy! Lovely photo. Now, I’m ready for my trip to Paris. I would love to be able to walk down a street in Paris, nibbling these cookies! Jealous!! Yours look great! Lol! I had the same reaction at Herme’s when I visited Paris. I love these cookies! They’re one of my faves. Yours turned out just great! Well done! Your cookies are beautiful! You managed to make an ugly cookie look magnificent! Beautiful photos, as usual. Those look fabulous – I really enjoy cacao nibs in mine too. Lucky you to get to try them at PH’s! Maybe someday I’ll get to try the original like you did. =) I thought cocoa nibs were a great addition to these. You’re right, the hint of salt is what got me too! But I would think those cookies have a way too deliciously chewy heart, to call them: sablés! There is something about the texture that is just not quite like the “fondant” of a sablé. Nevertheless, you have an eye to make any simple cookie, look like the KING of cookies… just what it deserved! Bravo, Steph! Your photo is great — it really gets across the sandy, crumbly, deeply chocolate-y consistency of these cookies. I love that delicate saltiness of these cookies. would love to visit Pierre Herme’s as well – next time I am in Paris! Vibi– Our cookies must have baked up differently. I wouldn’t say that mine had the slightest bit of chew to them. IMHO, all things food taste wonderful in Paris!!! I love the cocoa nib idea, and will definitely try that out next time. Great job Steph! Beautiful job! It’s so cool that you were able to taste these directly from the source! GRREAT looking cookie! Delicious, too. I loved the salt and sandiness. Oh also, killer looking brownies on the post before this one. How DO you cut such perfect squares? Ya gotta love Dorie, huh. My cookies didn’t have a chew to them either. They were very good though. I am so jealous that you got to visit Pierre Herme’s! I’ve made these cookies twice previously and both times have had to add milk to the batter at the end to get it to all come together – any ideas as to what I might be doing wrong? Thankfully they tasted great anyway! Lovely photo! And how lucky to be able to eat them in Paris. Steph, What a great idea to solve the world’s woes, yes? Your “different” little addition is fabulous. I can’t wait to try it as well. Thanks for the beautiful photo. Your cookies look delicious. They seriously are a threat to my fitness routine. Nothing else has come close as of yet. Oh my!?! Oh, what a fun post…I loved all the little extra bits about Paris, etc. Such fun! Your cookies look amazing. I think mine were obviously a little too rustic looking…I was afraid of handling the dough too much (I never have the slightest clue what that actually means), so I just sort of let them fall where they may when I sliced them…I need to aspire to your cookie baking talents I see here…they look wonderful! So awesome that you went to Paris!! Your cookies look simply perfect too, I used fine sea salt on mine.. but the salt flavor isn’t too noticeable and they just seemed too sweet… I guess I’ll have to make them again.. maybe I’ll like them better with more salt flavor. How fun that you had these cookies before you knew they were famous! 🙂 They look great! Secretary of Snacks! That sounds like a great job! Love the photo — you can almost taste that cookie! What a neat experience – to go to that particular patisserie. I absolutely loved the cocoa nibs in these. Secretary of Snacks!!! LOL! Love it. Just make sure you’ve paid your taxes… Great looking cookies – I hope they reminded you of a trip to Paris! 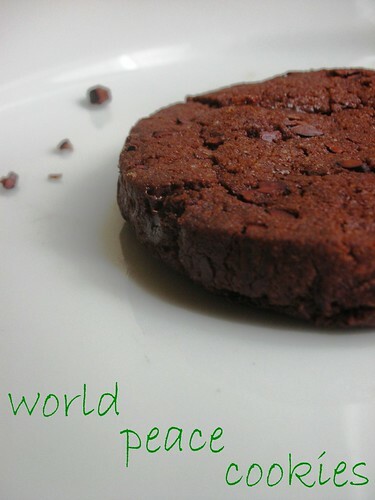 You actually HAD a Pierre Herme World Peace Cookie?! I am SO jealous… I need to go back to Paris now that I love baking and cooking… I’d eat every macaron in the place! Also, I must mention that your cookies totally need to be in his store display… because they are gorgeous! Secretary of Snacks. I like it!! (But make sure you have paid all your taxes!!) Those look good. And to have had the real thing – shazam!!! that is such a cool story… now i am dreaming of paris 🙂 great idea to use cocoa nibs! The visual I have of you scarfing down the entire macaroon display at Pierre Herme’s has me snickering. I can relate. The U.S government could only benefit by having a Secretary of Snacks. I love your photo! Hmmm chocolate cookies! Wow! You’ve had THE ACTUAL Pierre Herme cookie? How cool is that? Your cookie looks great and the next time I make them, I’m going to add the cocoa nibs. I so need to get these made myself, they sound delicious! I’m so envious of your bag of sables from Herme! Wouldn’t it be fun to compare them side by side. I’m going to have to look for this particular fleur de sel. As always, a great post and a gorgeous photo! Oh WOW you’re picture is wonderful! you make them look SO good! Please feel free to visit and comment my blog! LOL @ secretary of snacks. Can I be your assistant? I’ll pick up the crumbs. YUM! ooh, I’ve made these. scrumdiddlyumptious!!! Gorgeous! I love the perfect shape of your cookie. I’m also incredibly jealous of your trip to Paris! Sounds like a plane ride you’ll never forget! Flying high over the clouds in a state of chocolate bliss. Your cookies look delicious! I love these! I can’t help but think that a Secretary of Snacks would have a positive effect on our government.